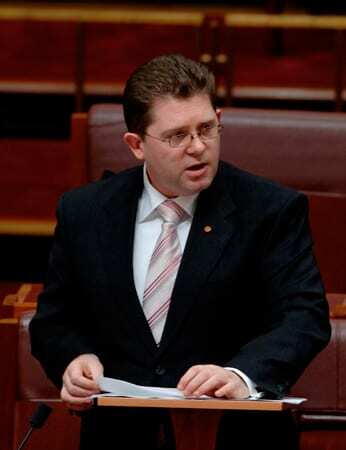 Victorian Liberal Senator Scott Ryan last night told the Australian Senate that there was “a highly orchestrated media campaign to vilify Israel” in the wake of the Gaza Flotilla Incident. “Several weeks ago we were informed that Israel had allegedly outrageously intervened to stop a so-called peace flotilla, with commandos launching themselves at a peaceful armada seeking nothing more than to take humanitarian aid to Gaza. Excuse me if I was a little cynical when I first heard the news, for despite days of a highly orchestrated media campaign to vilify Israel and her defence forces, the truth subsequently came out. These were not peace activists; they were agents of provocation, radicals seeking a violent confrontation as they broke the legal maritime blockade of Gaza. I did not realise that peace activists were so well armed, in this case, with knives, chains, firearms, molotov cocktails and pepper spray. By viciously attacking the soldiers, they quickly betrayed their true agenda with their anti-Semitic cries, as they did by their refusal to cooperate with the UN, Israeli or Egyptian authorities, who could have facilitated the entry of the humanitarian materials to Gaza. This was no peace flotilla; it was part of an orchestrated campaign to vilify the state of Israel for doing nothing more than would be expected of us in this place: to protect her own citizens. The blockade of Gaza is well founded in law, but it is also well founded in the entirely legitimate need for a state and government to take reasonable action to protect its citizens—for Gaza under Hamas cannot be treated as if it or they were a reasonable neighbour, and in no way can it be considered a partner for peace. This blockade has been undertaken to prevent terrorist at- tacks on Israeli civilians, no matter their race or creed. For some reason, certain people, NGO’s and so called human rights organisations expect Israel to tolerate a much higher level of violence than in Manhattan, Melbourne or Manchester. To those who do not understand what Hamas does to the innocent civilians of Israel, I urge you to go to Sderot. Look at the remains of the rockets that have been fired from Gaza into that neighbourhood by Hamas—intentionally fired from amongst civilians in Gaza so as to make detection and prevention more difficult. Visit the children’s playgrounds in Sderot that are made from reinforced concrete. Bomb shelters are painted as coloured snakes in lieu of a playground, as children need to be within seconds of safety as the sirens blare ‘code red’ as another rocket is launched. Speak to the mothers of the children to whom the word ‘red’ provokes fear because of these sirens and amongst whom mental illness—particularly anxiety, stress and depression-related disorders—are at un- precedented levels. Go and look at the schools which have concrete slabs above their roofs in an attempt to limit the carnage caused by terrorists firing rockets from only a kilometre away, to whom a school is noth- ing more than a target. This is the situation for Israeli towns along the border with Gaza. And why is it that we do not hear of the brutal rule of Hamas and what its clear and stated agenda is? It cannot be through innocence; it can only be through ignorance. Hamas does not seek to hide its agenda, at least on its home turf. The truth is that Israel had allowed elections in Gaza. The corrupt Palestinian Authority lost to the terrorist organisation Hamas. The electoral attitude of Hamas can be best summed up as ‘One man, one vote, once,’ for elections are not regular. And pity those who might attempt to compete with them anyway, as thuggery and violence rule, rather than the ballot box. Despite a lack of coverage of the reality of Hamas, we should be in no doubt as to what it is. It is a terrorist organisation, dedicated to the use of violence against innocent civilians to achieve its objective. In this case its objective is nothing less than the elimination of the Jewish state and of Jews in their homeland. Across Israel, Hamas has killed thousands, Jewish and Muslim alike. Shrapnel from terrorists does not discriminate. For this reason, Israel blockades the rogue state that is Gaza—but so does Egypt. Contrary to the perception created by some reports, this blockade does not pro- hibit the entry of food and medicines. It merely ensures that the materials going into Gaza are not diverted into the tools of violence and terror. So what was the real agenda of this alleged peace flotilla? It was part of the campaign to delegitimise Israel in the West. It was intentionally aimed at weak- ening the historic friendship between many nations of the West and the only liberal democratic state in the Middle East. Over the past decade, a campaign of vili- fication against Israel has been undertaken by elements of the left in the West. Using NGOs, an occasionally ignorant media and a lack of understanding in the West of the existential threat faced by Israel, they have joined with other groups, including violent Islamic groups in the Middle East who seek to destroy Israel. The incidence of academic boycotts and the use of terms such as ‘apartheid’ are all an attempt to achieve through factual manipulation what the enemies of Is- rael have not been able to achieve through other means. It could not be achieved by three wars and it could not be achieved by an unprecedented terror campaign against civilians, so now these organisations seek to weaken Israel by demonising and delegitimising it, weakening its alliance with other nations to diplomatically cripple and hopefully destroy it. This was merely the latest media stunt in that campaign. For those who doubt the intensity of the hatred of Is- rael and its people, have a look at what is on some of the television stations in its neighbourhood. I have seen a dramatic serialisation of that historic slur The Protocols of the Elders of Zion being broadcast on television as if it were a mini-series we would see on our own TV screens, and the portrayal of a Disney-like children’s character being killed by Jews on a children’s program. And, of course, there is the constant denial of the reality of the Holocaust. These are just some of the examples of horrific anti- Semitism fed to millions of people via their TV screens, endorsed or tolerated by Israel’s Arab neighbour states. And while Hamas is of immediate interest with its control of Gaza, it is far from the only offender in creating and furthering racial hatred. The Palestinian Authority has maps on its walls that do not recognise the state of Israel. I have seen them. The schoolbooks the Palestinian Authority distributes to schools contain no reference to Israel or the three wars that were started against it. They have even named and funded a soccer tournament after a prominent suicide bomber. Israel and its citizens, including Muslim Arabs, do not live in the same world we do; they live in a world where their neighbours seek their violent destruction. No government is perfect. No state is perfect. But that does not mean one abandons those simply in need of security. In this case, it is the people of Israel who have that need—the need for no more than what we expect in Australia. A group called ‘Australians for Palestine’ has been running a campaign entitled ‘Time to hold Israel Accountable’. Israel is accountable to its people via elections, courts and the rule of law, while Hamas, the Palestinian Authority and Israel’s other neighbours are not. Israel has a right to protect itself, and the campaign to undermine this must be opposed. More importantly, it must be exposed. The lies and misrepresentation of facts and the application of double standards in considering Israel’s legitimate right of self-defence cannot go unanswered. I admire you for your statement to the world. I wish with all my heart to see your words spread all over to those who know the truth and to those who take sides with those who hate Israel . I wish your words will let them understand and perhaps it will give them the courage to read the facts before taking sides. Thank you for all those who did not survived the Holocost, and to those who had the courage to speak loud against the great injustice to humanity. Could we please borrow your senator Ryan for a while and have him spread the truth around here in France ? Our french politicians are just a bunch of crap ! Wow, what can I say….thank G-g there are still people in the world who recognize and speak the truth. I wish I can give this man a kiss and grateful thank you for using his position to spread the truth and help real peace have a chance to flourish. We thank G-d for you Senator Scott Ryan our much needed defender. It’s time for Israel and the Jews who support Israel to get up and fight back, the loss of Israel means the absolute doom of humanity, It’s time to identify the true enemies of the Jewish people within the heavily biased media and the self loathing Jews and their leftist coalition, it’s time to out them as individuals and openly publish who they are, tare their lives apart piece by piece and expose them for their bias, If these skanks are not stopped and Israel is not supported it will not be there in 15 years, neither will Europe or the cesspool that is the UK. While it’s gratifying to know there are individuals who see the truth in this situation, unfortunately the rest of the world seems to live in a Bizarro world where the terrorists are the defenseless victims and the people of Israel are vilified for simply trying to live their lives in peace. –is kevin rudd and the (rest of labour )really that ignorant (very scary if he is ) or does he need to pander to the islamic extremists knowing they are happy to slaughter our children if he crosses them?? Outstanding comments, Senator. That’s one way to be rewarded by God with everlasting bliss! What an honorable, fine human being.God bless you and yours! It’s pleasure to see someone clearly seeing the reality of Israeli existence and relationship of Israel and its neighbors. It is even greater pleasure to see all of that stated freely and loudly, by a person of importance. Thank you, senator Ryan. Thank you very much! the truth is not good enough for the media,,,,,most of them like to see israel on there knees,,,,,why ? its big news….. There is no our side-their side. There is only truth and lies. 3 years and 8000 rockets AFTER Israel left Gaza in hopping that this will bring peace and if not peace at least some quiet. No such luck! The once prosperous zone inhabited by Israelis was very soon transformed in a rocket launcher site and training grounds for terrorists. All what we, the Israeli people want is to be left alone. We prefer keeping us busy with start-ups, Nobel Prises and building our country. We also should prefer the the port of Gaza will not became an Iranian port arming the Hamas. Look what happened in Lebanon, look how well armed the Hizballa is. Want to help the people of Gaza it’s OK with us, all we ask is to let us be sure that the “humanitarian aid” does not consists of rockets, arms or explosives. Bring chocolate, we’ll passing it on. I promise! Thank you so much Senator! We need more level headed poloticians like you! Thank you, sir, for outlining the true situation with such clarity. I returned from Israel AND Turkey just one month ago. I wanted to see with my own eyes what was really going on. What I saw in Israel were people from all over the world; Jews, Christians, Muslims, Bahais. and Buddhists, all living side by side in a tiny democratic land with freedom of religion. These are people who want to simply raise their families, work, celebrate holidays, and enjoy life, as do people elsewhere. Gaza is militarised solely because of the ongoing violent actions of Hamas. Also, because of the PLO’s historic attitude: NO recognition of the State of Israel and NO negotiation. The IDF once captured the Temple Mount and the Dome of the Rock during a self-defensive war years ago, and then GAVE back the keys to the ‘mosque’ the same day. Any other nation that did this would be honoured with a Nobel Peace Prize. I slept in a bomb shelter when I was in Israel. They are an everyday thing there. Have a look at a map of the Middle East, at how incredibly HUGE the Muslim nations’ land area is, and tell me that this ongoing travesty is about LAND! The world hated the Jews when they lived in exile throughout the nations, and now they hate them for living in a tiny home of their own. Israelis know that the world cannot be placated, no matter what they do. I’m proud that one politician in my country says it like it really is. May you be blessed for all time, Senator Ryan. Thank you for your support. We feel rather lonely and threatened over here. Common sense is out there, we just have to look for it! Thanks for your support! A well made stand Senator Ryan. May God bless you. We needmore politicians like Scott Ryan! He speaks the truth! !Have we all forgotten 9/11?He should stand for the job of Prime Minister!!!! Scott Ryan speaks the truth!!!! He should stand for Prime Minister!! Gosh, absolutely amazing, at least one politician is on our side!